This traditional frame and panel design includes two drawers, two doors and a dry sink. 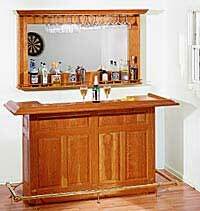 Authentic wall mirror unit displays and stores glasses and bottles. Full size patterns for all shaped pieces Detailed exploded view Step by step instructions Complete material list.